In stock. Order in the next 19 hours, 22 minutes and it will go out today! Welcome to FLOATFX, The Ultimate Levitation System. This is more than a magic trick; this is a complete levitation kit. Using the secret apparatus enclosed, you will soon be able to perform some of the greatest close-up levitations in the world. Imagine being able to take a playing card and spin it in mid-air. It hovers from hand to hand and around the body, before hovering right back up to your hand. Or, borrow a dollar bill and suspend it in mid-air without any visible means of support! You will even be able to spin a quarter and have it hover horizontally between the palms of your hands! The same materials used by the world's greatest magicians on national television to perform unbelievable close-up levitations! Learn the secrets of the hovering card. This booklet gives detailed instructions to perform basic and advanced moves as well as over a dozen bonus effects! 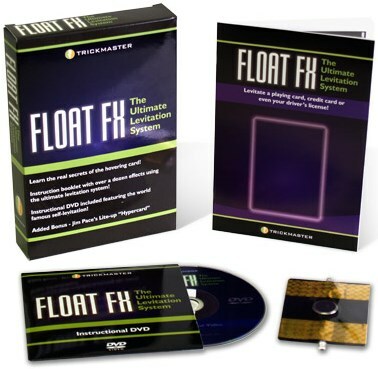 This DVD shows you step-by-step how to set-up your levitation system and perform all the various effects with it. Once you have mastered the moves on this video, you will be able to float just about any card shaped object - float credit cards, playing cards, or even your driver's license! Also includes a special section where you will learn the secrets of the world famous self-levitation! As an added bonus, you will also receive Jim Pace's "Hypercard". This is one of the most amazing accessories you can float. The "Hypercard" is a specially designed lite-up card that creates the illusion of a miniature flying saucer! The super bright lights will mesmerize your audience as the card hovers in mid-air!